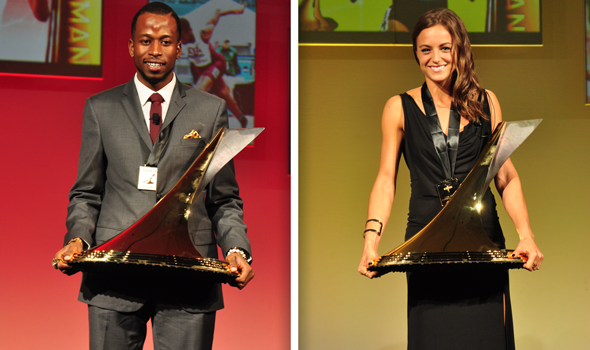 PHOENIX – Texas A&M sprinter Deon Lendore and Oregon mid-distance runner Laura Roesler were awarded The Bowerman Trophy as the most outstanding male and female collegiate track & field athletes of the 2013-14 season in a ceremony held Wednesday evening at the JW Marriott Phoenix Desert Ridge Resort and Spa as part of the U.S. Track & Field and Cross Country Coaches Association Convention. Roesler is the first female athlete from the Pac-12 to win the award, and Lendore is the first male athlete from the SEC to win. Lendore is from Trinidad & Tobago, making his win the fourth straight by an international man. Roesler is the first athlete of either gender to win with the 800 meters as her primary event, while Lendore is the first man to win on the strength of his performances in the 400. The award show, which was streamed live on TheBowerman.org, is embedded below. Ryan Fenton hosted the ceremony, while Alex Lohr and former Bowerman winner Queen Harrison hosted the red carpet show. "I’d like to thank God for giving me talent and bringing me to the United States, and the board for selecting me," said Lendore after joining one of the most exclusive clubs in track & field. "We’re all great athletes, and all of the finalists are winners today," he added. Lendore put together one of the most dominant collegiate campaigns ever. He ran in eight 400 meter finals in 2014, winning them all and going 1-0 in the 200 to boot. His 45.03 was the fastest indoor time in the world this year, and his 44.36 outdoors led the NCAA. In addition to indoor and outdoor national titles in the 400, the junior anchored the winning 4×400 meter relay and the runner-up 4×100 at outdoor nationals. Roesler was similarly untouchable in 2014. The Duck senior won six out of the seven collegiate 800 meter finals–including the indoor and outdoor NCAA championships–she entered this season. (Her only loss at any distance this year came when she dropped out at the MPSF indoor meet) She’s one of the fastest collegians ever. Her 2:00.54 at Mt. SAC is the fastest in NCAA regular season history. She joked "I want to thank Coach Mauricia [Powell] and Coach Johnson. I know that you had to put up with a lot with me, but…we’re here now" to huge laughs from the crowd. Both Roesler and Lendore won the fan vote this summer. They join the ranks of former winners of The Bowerman that includes decathlon world record holder and Olympic gold medalist Ashton Eaton, 1500 meter world champion Jenny Barringer (Simpson), Olympic 10k silver medalist Galen Rupp, 2013 100-meter hurdles world champion Brianna Rollins and 2012 Olympic high jump bronze medalist Derek Drouin. In addition to her individual exploits, Roesler was a key cog on a 4×400 meter relay squad that clinched an NCAA indoor championship for Oregon and finished third at the outdoor national meet. She blew away the competition in both NCAA 800 finals, winning by 1.68 seconds indoors and 1.70 seconds outdoors. Lendore’s performances against collegians compared favorably to most professionals’ seasons this year. The junior ran the fastest indoor 400 time in the world, and his outdoor season best (run at the SEC meet at Kentucky) made him the fourth-best performer in the world this year. Like Roesler, Lendore had an outstanding relay season. His 44.63 split for the Aggie indoor 4×400 is the fastest two-lap split in college history. And his anchor leg in Eugene clinched the 4×4 outdoor national title for Texas A&M. That squad ran 2:59.60, just one one-hundredth of a second shy of the collegiate record. Flotrack caught up with Lendore after he won college track & field’s highest honor. Clemson’s Brianna Rollins and Indiana’s Derek Drouin are the reigning winners of The Bowerman, which is named for legendary Oregon track & field and cross country coach Bill Bowerman. Past winners include Olympic gold medalist, World Champion and decathlon world-record holder Ashton Eaton (2010), 10,000-meter Olympic silver medalist Galen Rupp (2009), 2011 IAAF World Champion at 1500 meters Jenny Simpson (2009), 2013 100-meter hurdles World Champion Brianna Rollins (2013) and 2012 Olympic high jump bronze medalist Derek Drouin (2013).